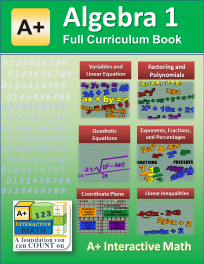 This book is a comprehensive math curriculum book for the 8th grade (Algebra 1) math. It contains easy to understand and fun math lessons that teach various math concepts with appropriate visuals and text. It has over 500 pages printed textbook(B&W) with excellent visuals that help your students understand math concepts clearly.